I have had my fair share of tanning disasters. Especially during my time at uni. There was the almost permanent smell of digestive biscuits that lingered around me; many a stained bedsheet *keep it clean folks* and an unfortunate spray tan incident that left me with a tan line that Borat would have been proud of…. don’t ask… I looked like I’d worn a mankini! When it comes to tanning at home I have tried pretty much everything out there. Luckily as the year’s have passed, I have become a lot better at the application! I always exfoliate beforehand -(my top tip is to buy a pair of exfoliating gloves to give yourself a darn good scrub without having to fork out on any more products – just lather up your everyday shower gel) and I make sure to spend plenty of time massaging the product in to make sure I don’t miss a spot. I stand by the fact that when it comes to fake tan, you can’t put too much on- It’s when you don’t use enough that it becomes patchy. Up until recently my weapon of choice when I needed to add a summer glow was the St Tropez Self Tan Express Mousse. I love the fact that you can leave it on for between 1 – 3 hours rather than overnight (avoiding the stained bedsheets!) and wash it off to reveal either a subtle golden glow or a “week in the sun” look depending on the length of time. 3 hours is a short-time for tan development so it was easy to do the morning of an event. HOWEVER, 3hrs is a lifetime compared to 3 minutes! At first I was sceptical about the 3 minute claim – how could this possibly work, especially if you shower it off?! But believe me, it does. There are a few negative reviews about this product saying the tan isn’t dark enough, and I get that if you use it once and call it a day, you probably won’t notice a difference. But if you use it for three consecutive days and then 2-3 times a week there after, you really will develop a beautiful summer tan. It’s not a deep, dark, fortnight in the Caribbean tan – it is subtle- but it certainly took my skin from pale and interesting to “week in the garden” and makes me feel more confident to wear skirts with bare legs and strappy tops. What I REALLY LOVE is that this is fool-proof. I have experienced zero patchy parts, no stripy wrists and none of the tell-tale orange fingers. I absolutely love this product and think it is a must-have for anyone who likes the idea of fake tan but is too busy or (as in my case) can’t be arsed to faff around! I simply shower as usual. Turn off the water, rub this all over, brush my teeth (I have a two minute timer on my toothbrush), awkwardly count to around a minute, and then rinse off. The Sweet Almond oil means that your skin will be hydrated without the need for extra moisturiser (although some evenings I do use a body balm as I have extra-dry skin) and there is no smell of biscuits! 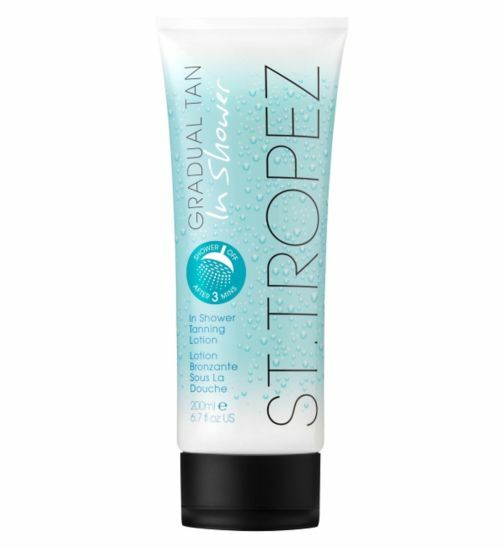 St Tropez Gradual Tan in Shower Lotion is on special offer now in Boots, reduced from £14.50 to £9.67. Go try it out before I buy all their whole stock! Word of warning: It does say on the bottle to make sure you rinse out your shower else it gets too slippery! I have bruises to prove this is true – so be careful. Better yet, if you make this a regular routine invest in a granny-style non-slip mat! Laugh away, but you don’t want to be hobbling down the aisle on crutches! Posted in Beauty and tagged Beauty, Boots, Self-tan, skincare, St Tropez. Bookmark the permalink.